Happy Friday and World Card Making Day Eve!! Tomorrow is the official day of World Card making day and I will have some projects to share with you the whole weekend!! 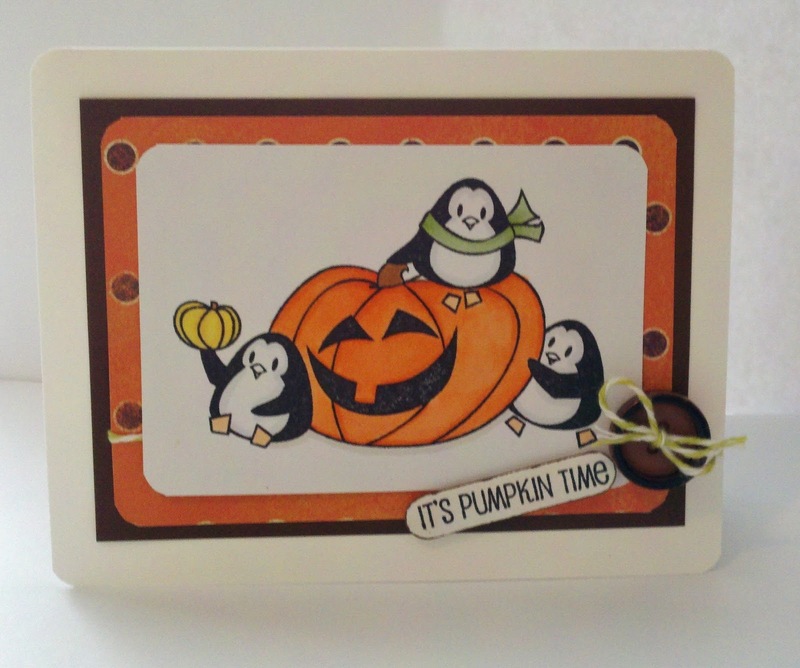 I will be participating in Angela's Craft Corner's Blog Hop that you don't want to miss! 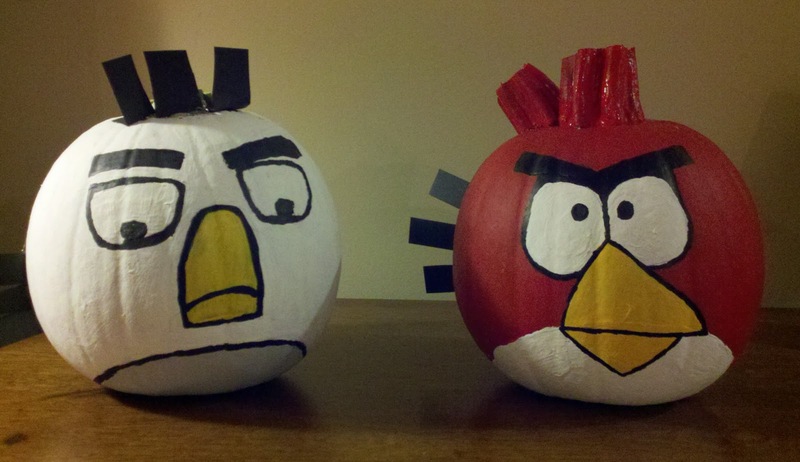 Candy to be won and some great Halloween ideas to be shared! On top of it all, it is my dh and my 10 Year Anniversary tomorrow and we have a great night planned for us, so I will spend tomorrow with the family. I can't believe it has been 10 years for he and I but it has certainly been 10 great years!! 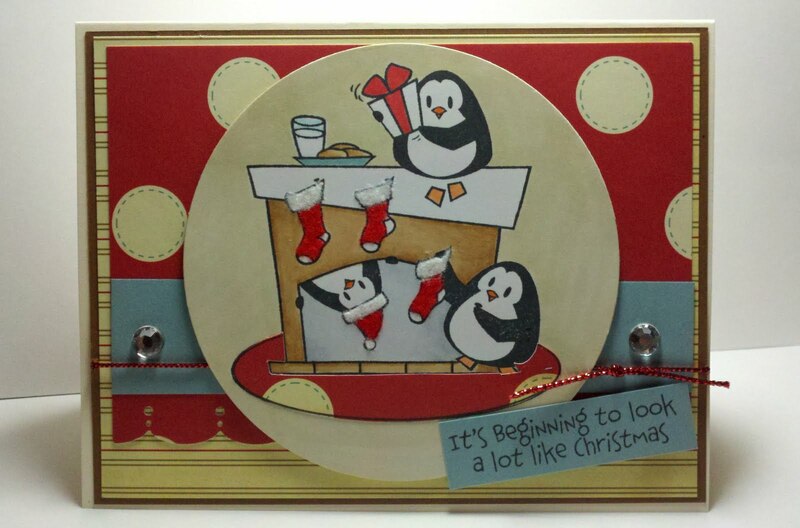 For this card, I used Our Craft Lounge set for the sentiments while the dp was the main focus of the card. 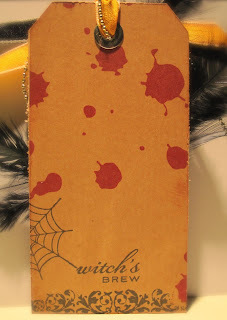 I used MFT's spiral Die-namics for the top of 'teacher' with some Cosmo Cricket chipboard pin head. I do not know who made the dp, but the alphabet dp on the bottom is Bazzill. The bits of color on the sentiments are colored in with Copics. Don't forget that there is still time to enter for my Blog Candy of 100 sheets of 6x6 Wild Asparagus paper!! Click here to enter!! 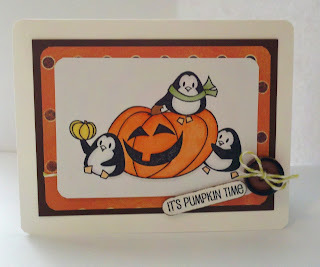 I sure hope you join us this weekend for the Gouhlish Blog Hop and your chance to win more candy!! Thanks for stopping by and taking a peek!!! I just wanted to share with you a quick card I made for a close friend of mine who lost her mother recently. Her mother liked the color blue, so I really wanted to capture those colors and her style in the card. I used K&Co dp accented with some crystals and a large paper flower made by Recollections. I stamped the sentiment on a small chipboard tag which I colored and distressed using Tim Holtz distress inks. The sentiment is stamped using Bamboo ink from Momento with PTI On a Limb set. I finished the chipboard with some mini brads and popped it up with some mounting tape. The base is SU! confetti cream cs. 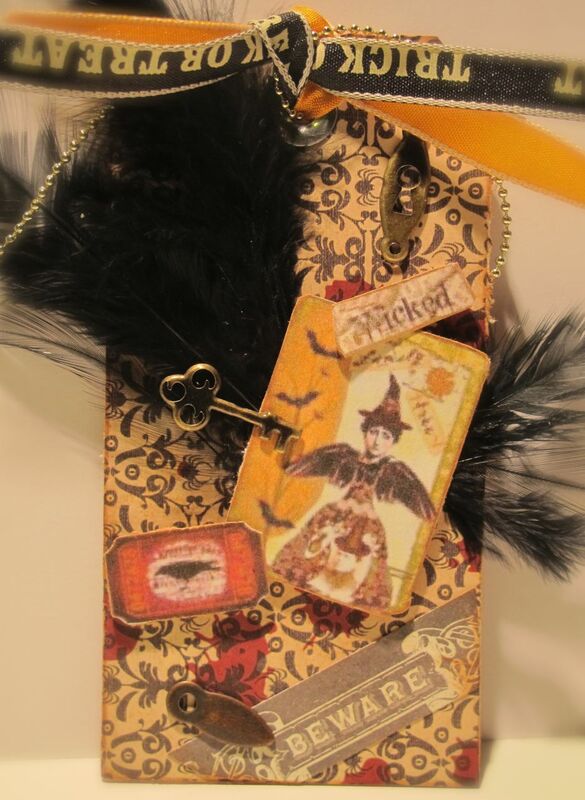 Don't forget about The Ghoulish Blog Hop with Angela's Craft Corner this weekend! Click the icon for more information. I am excited to share my project that I am working on! It should be a 'Ghoulish' time with some goodies to be won!! Thanks for stopping by and taking a peek!! Super Birthday and Blog Candy! I hope you all had a great weekend and did something fun! 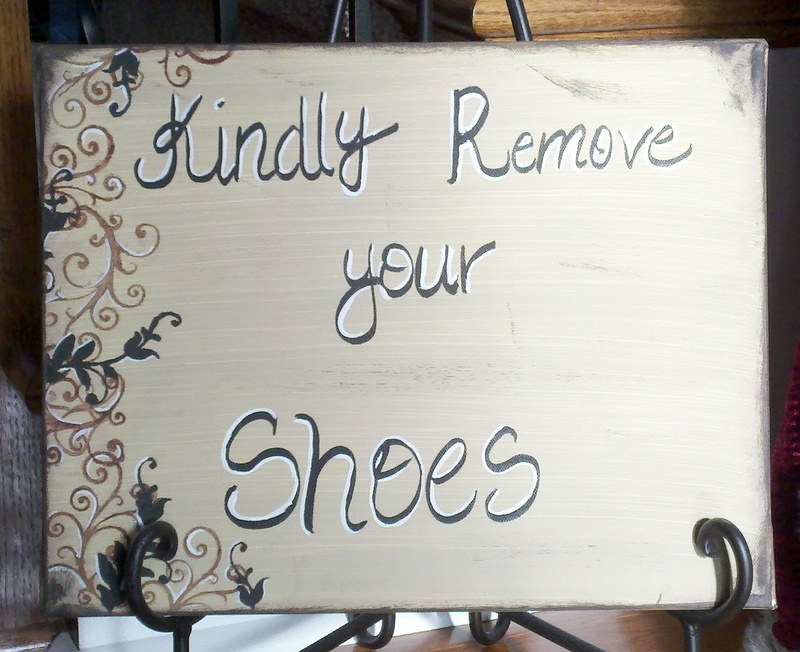 I had been putting my house together after family had been in town so nothing too fun! Last Monday was my twins birthday and they were so happy to receive a few items they had been asking for. I made them a card each which I love doing because even though they are boys, they still really appreciate the handmaking of my cards and save all that I have made for them! 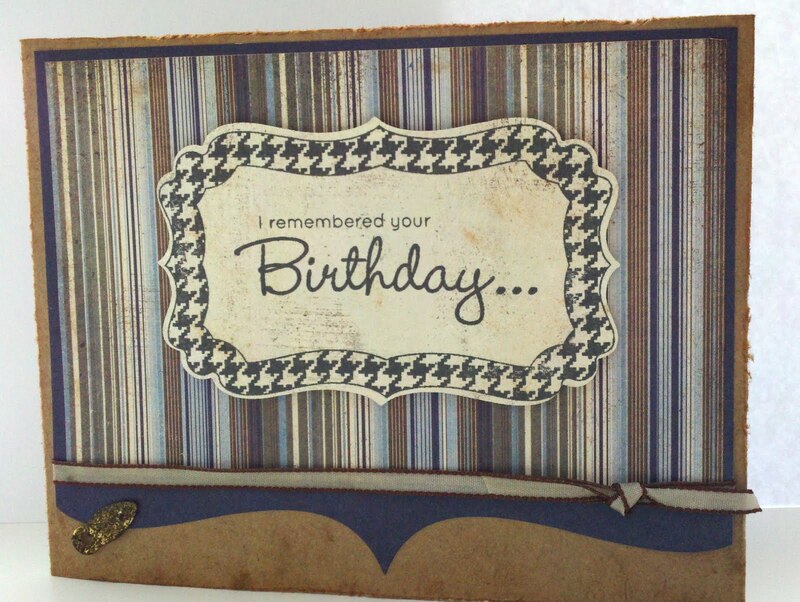 For this card, I used MFT's Pure Innocence line with matching chipboard for a popped up effect. I colored in the image with Copics and used The Cat's Pajamas Happy Birthday sentiment from A Beary Good Year. I cut out some stars using my nesties and finished it off with some metal dots. The green background on Happy Birthday was colored with Copics to match the paper which I believe I have had from the $ spot. The inside sentiment says "To a Super kid!' I made two different styles of this card. It's crazy that I have so many birthdays to remember this month, including my twins, that I am playing some serious catch up! This week has already started off hectic with some family coming into town tomorrow, the kids sports, and the usual house stuff. I told my hubby that so far my new craft room is nice to look at but there is not much action going on! : ) I guess I will need to re-train myself into being a night owl so I can actually create! 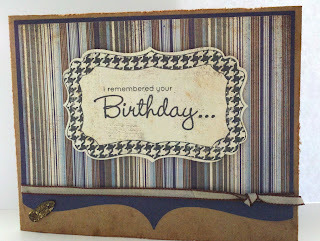 But for todays creation is a birthday card I made for a fabulous friend using The Cat's Pajamas set. I love this one as it is not only cute, but the sentiment always makes me laugh. 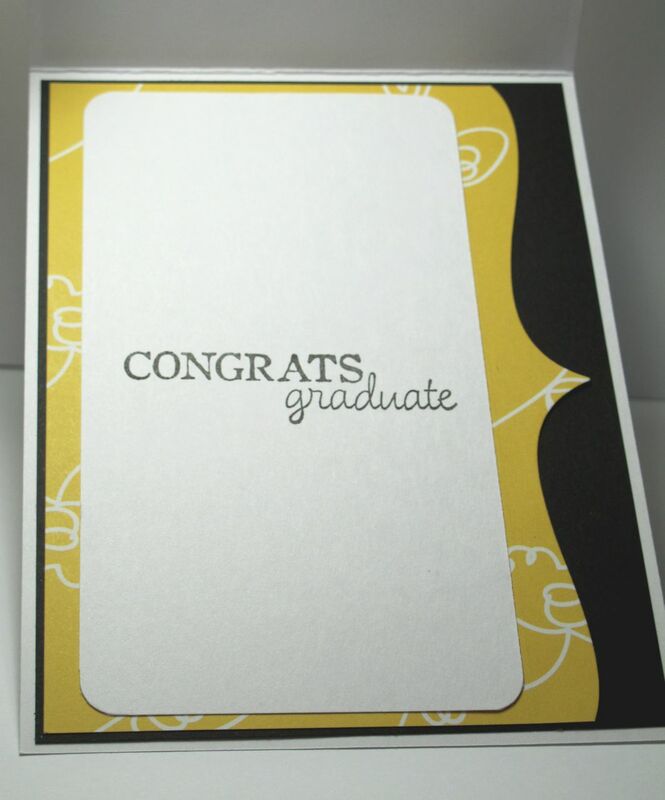 Especially when making a card like I just did for a person whom it will fit perfectly!! Here I used some American Crafts dp along with SU! PP and OO cs. I utilized my long rectangular scalloped nestie for the center and colored the image with Copics. I popped up the image and finished it off with some sheer ribbon, button, and kiwi twine from MFT. 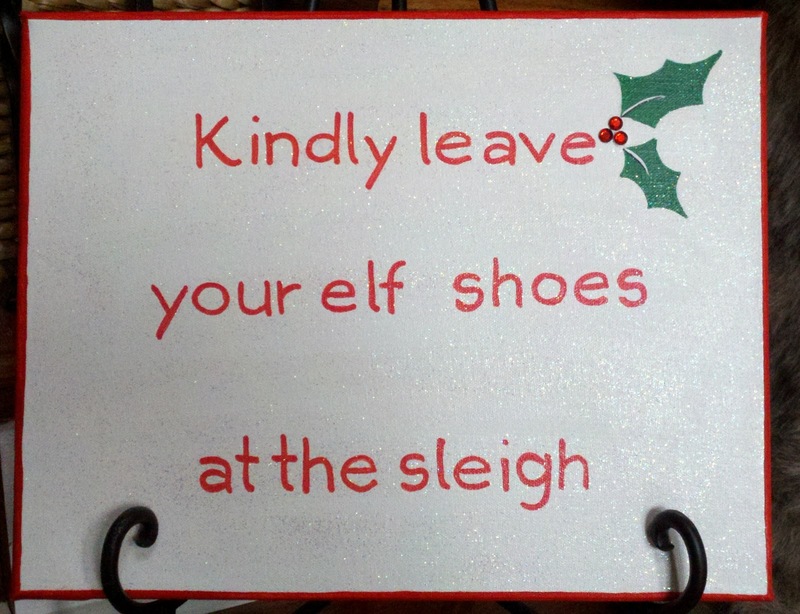 This is the inside sentiment... always makes me giggle. I mirrored a bit from the front the inside dp and edged the white cs with ink. I know it has been quite some time since I have posted anything. These last few months have been an adventure to say the least with our move to TN from NC, summer vacation (we drove to CO), illnesses (you know that has to happen! ), and beginning a new school year at a new school for the boys!! Prior to our move, I had been creating here and there before the packers came to pack up all my things. I will be posting those items to share. We literally had the packers come the day after school let out and we were on the road to our new home a week later. So, for my comeback post, I am dedicating this for Cammie. LOL!! She threatened me to post soon or she would have to come and force me to use my new craft room. I wish I could have stopped putting together my room in an evil plot to make her come here, but I just couldn't. :D I really wanted to get it finished. I had to methodically think this new room since it is really the first time I have had an entire room to my hobby and I wanted to purge, clean, and set it up to what best works for me!! I have some empty spaces, but I'm sure it won't be long before I use that up too. For a start, this is a great set up for me since I really like to have everything at my fingertips. So, without further ado, I would like to share with you some pictures of my new space that I am excited to use!! My island workspace/cutting table. Lots of empty space, but I will figure it out! No space of the closet was wasted that I re-used some Ikea rails I had and some Ikea curtain clips to hang up my CB folders and the baskets to be used for other odds and ends. Inside the closet where I house my reference file of clear stamps and what little SU! stamps I still own. Inside, I house large backgrounds stamps, acrylic paints, extra envies, etc. The other side of the closet houses my other hobby of jewelry making items. I couldn't figure out where to place my 8x8 and 6x6 pads where I could see them and have them available, so used an office sorter which works out perfectly! I created my 'L' shaped area with the help of my awesome hubby. Everything is from Ikea. On the left, I use that as my sewing and CB area. 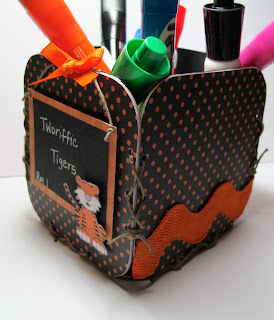 I re-used more rails I had to hold my colored pencils and items I use often. I still have all my SU! inks that I never use and just don't know what to do with. And for my liquid items and such, I used a spice lazy susan to hold it all. My Scor-Pal is easily accesible next to that. The drawers holds my puches, glitter/embossing powders, binding items, envelopes, acrylic blocks, etc. These shelves are re-used as well that uses to hold my kids Legos and I decided it was perfect to hold more ribbon and embellishments. The ribbon jars are 1/2 gallon jars from Wal-Mart and the spice jars are from Ikea. The large container holds all my yummy MFT bakers twine. For an inexpensive Clip it up type thing, I used a curtain wire from Ikea that my husband drilled into the sides of my shelf brackets and it holds other small embellishments. Love it! This is a DVD hanging file box that holds all my dies. I love the simplicity of it. 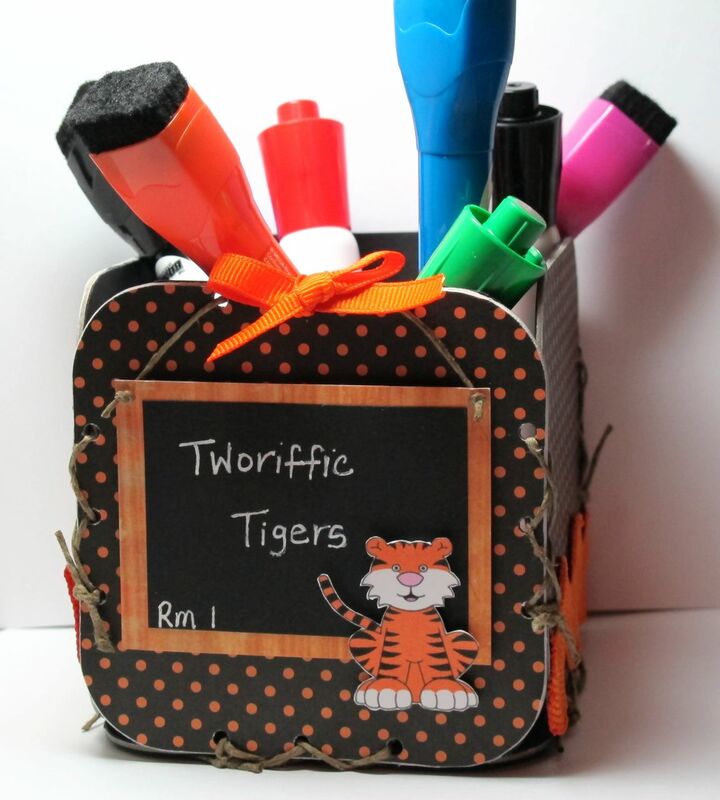 I hope you enjoyed peeking into my room and hopefully getting some easy ideas to organize items you have!! Thank you for stopping by and for those of you who have been patient with me, thank YOU!!! Is definitely a friend with chocolate!!! Happy Monday everyone! I hope you all had a great weekend and enjoyed some good weather! 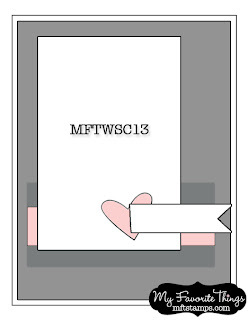 I thought I would start off the week with MFT's WSC on SCS. I inked up another darling Pure Innocence stamp called Sending a Box of Love. Don't look too closely as I had some ink on my block apparently and when I stamped, I got some of that ink on the panel!! I hate that!! Well, when I send this card I will have to put another panel on top and restamp carefully! Well.. I am off to prepare for a meeting I am running tonight with my husband's unit and get a few things ready for our house hunting trip this coming weekend!! We are certainly staying busy around this house!! Thank you so much for stopping by and I hope you have a fabulous day! !